Vikipetã, or Wikipedia in Guarani, is a version of a free web encyclopedia that anyone can edit, and that strives to be the “sum of all human knowledge.” Vikipetã is one of the 291 versions of the encyclopedia in different languages available on the web. This version began in 2005, and has 3,091 entries about Guarani culture and other topics of general interest. It has a diverse group of contributors from different countries — mostly Paraguay — who work individually without any central organization. 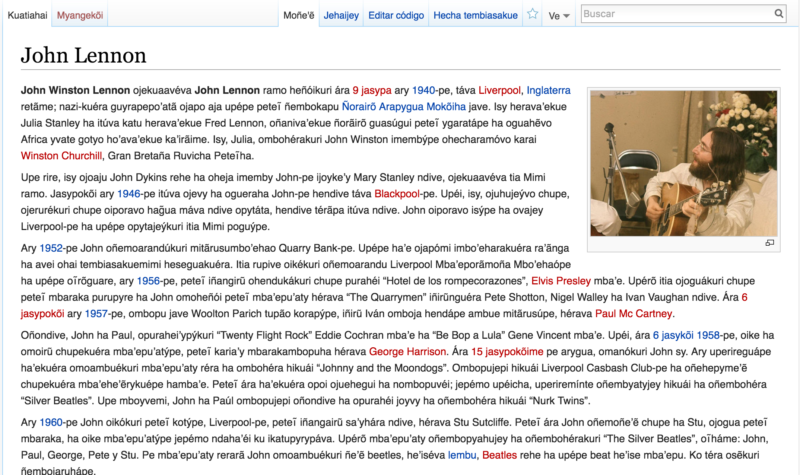 Vikipetã is hosted on the web servers of Wikimedia and managed using MediaWiki software, a free, open-source wiki application. These platforms allow for collaborative editing from a web browser or mobile device. The Guarani version of Wikipedia was officially created on November 13, 2005 by an anonymous user (with an IP address from the United Kingdom). This took place before the Wikimedia Foundation put in place new policies that established conditions for the creation of version in new languages such as trial periods and official projects. Regardless, the site did not begin receiving significant contributions until December 2007, many of which made possible by a collaboration between David Galeano Olivera in Paraguay and Šarūnas Simkusun, a Wikipedia editor based in Lithuania. Galeano Olivera is a professor, writer, linguist and the president and founder of the Center of Guarani Culture and Language, an NGO founded in 1985 with the goal of promoting and sharing Guarani language and culture. Its principal activities include investigations, training and producing publications. Galeano and Simksusn were two of the editors interviewed for this case study, along with Paulo Freitas, a Brazilian now living in Asuncion, Paraguay. Although other editors have worked on the site, not all could be contacted or responded to interview requests. Because it is a decentralized project, any editor can choose the topics about which to write. Galeano has focused on articles related to Guarani culture, and little by little he has diversified the content, which now includes other topics of public interest. Although there is content about popular topics such as entertainment or sports in other languages such as Spanish, the Guarani articles about Guarani culture and Paraguay have the most information. Galeano indicated that he uses his articles in some lessons about Guarani language and culture, but that in general, Vikipetã is relatively unknown in Paraguay. Local media will occasionally write about the encyclopedia, but Wikipedia in Spanish is used much more often in educative settings. Paraguay is unique in South America: Roughly 90 percent of the population speaks Guarani — often as a second language — although indigenous communities comprise less than 5 percent of the population. Galeano recognizes that it is necessary for more native Guarani speakers to participate in editing Wikipedia. However, he also referenced the reality that faces many indigenous communities in Paraguay. Many Guarani communities live in poverty, without access to land or adequate housing, and have been widely marginalized in the country, so participating in a web-based project might not be a priority for them. This situation represents an obstacle that will be extremely challenging to overcome. The version of Wikipedia considered in this case study is Wikipedia in Guarani, which was created before the formation o the Language Committee. Guarani, which forms part of the Tupi-Guarani language family, is spoken in different dialects in the region: in Paraguay and parts of Brazil, Bolivia and Argentina. Although speakers of different dialects can generally understand one another, there are definite differences in the words used. Also, because Vikipetã is written principally in Paraguayan Guarani, the number of editors may be limited. A number of users have found editing and coding difficult to learn and consider it a barrier to access. In 2015, the Wikimedia Foundation introduced a Visual Editor, which is designed so that the markup language is easier to master. But it is still in a trial period and only available for registered editors who’ve selected the option. The Visual Editor is similar to writing an email in a webmail client or blogging software, allowing the user to visualize how finished text will look after formatting. Wikipedia can be edited from a mobile device, although some find it difficult. For that reason, most editors prefer to use a laptop or desktop computer to edit. However, some small modifications, such as deleting entries, can be accomplished on mobile devices. Citing references is an important characteristic of the Wikipedia infrastructure. It’s not a site for an editors opinion or point of view, so all articles should have references to other website, news stories, books or other sources. However, primary sources are more scarce in Guarani than in many other languages. Finally, although there are always more Guarnai-langauge web projects, such as the Guarani version of Firefox, there exist fewer articles in Guarani than in Spanish. It’s estimated that more than 50 percent of Paraguayans that speak Guarani also speak Spanish. Because much more information is available in Spanish than in Guarani, many students and educators chose Wikipedia in Spanish as their main reference source. The editor team of Galeano and Simkus have identified ways to make the content of Vikipetã available in places without internet access. In those situations, it’s useful to render the texts in aversion that can be consulted without an internet connection, such as through programs such as Kiwix, which allows anyone to download a a version of Wikipedia to save on a DVD and read without internet. Although this format does not allow editing, it can be an important resource for communities that lack internet access. The use of this kind of tool will allow the content of Vikipetã to reach a broader audience than would be possible if they were only accessible on the web. The editors with whom we spoke also expressed interest in improving coordination among the editors. They opened a Yahoo! electronic mailing list for interested editors and hope to increase its use. Finally, they mentioned offline encounters as a future goal, so that those editors working for the common cause of distributing knowledge and information in Guarani can get to know one another and recruit new editors.